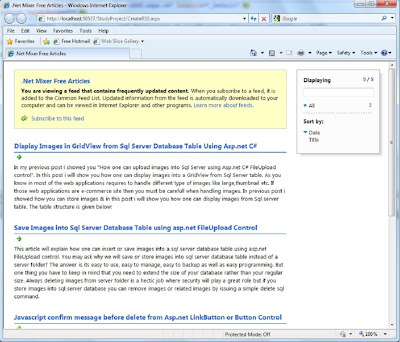 Here I will explain how to create RSS feed using asp.net. RSS stands for "Really Simple Syndication". RSS solves a problem for people who regularly use the web. It allows you to easily stay informed by retrieving the latest content from the sites you are interested in. You save time by not needing to visit each site individually. Step 1: Create Table In tblRss SQl Server as below. Step 3: In Default.aspx page add these 2 lines of code. i create an application by following above procedure & steps but on front page i.e. 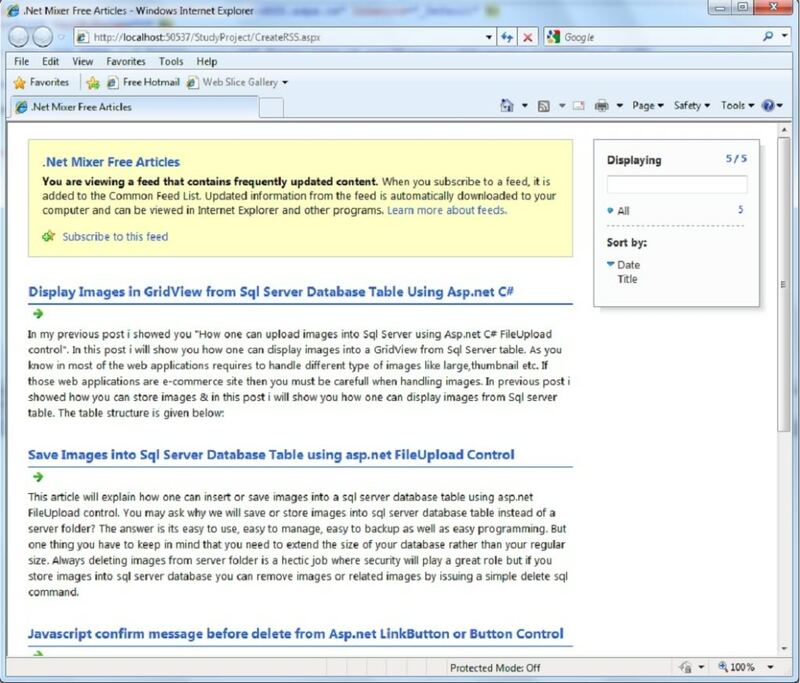 on aspx page which control we should use to display rss feeds? plz tell me it's important for me. No need of any control just create the page based on above process and run it output will display. Tell me something about Sharepoint also.. This feed contains errors. Internet Explorer will try updating this feed again later.iam getting this as result.Ihave 12 rows of data but display onli one row . Hi, I want to create a RSS feed for a asp.net web page by using jquery.How should I do? please help me..
3 years later and this code and still good. I needed a simple rss solution and this got me up and running in no time. Thank you for the post! Your output is generating in rss.aspx page, but i've to do generate it in xml like rss.xml. How can i achieve this? hw i can genrate xml nd show it on browser??????????? I want to display it on morquee html tag,please guide me how to do it. I got an error like this : "Line 11: public partial class GridviewEditUpdate : System.Web.UI.Page"
Thanks Sir, for this good article. Is there any library for creating RSS feed.